I’m a big fan of nice quality tea bags (for storage) – especially like the ones from DavidsTea that keep the air and light out of the bags. 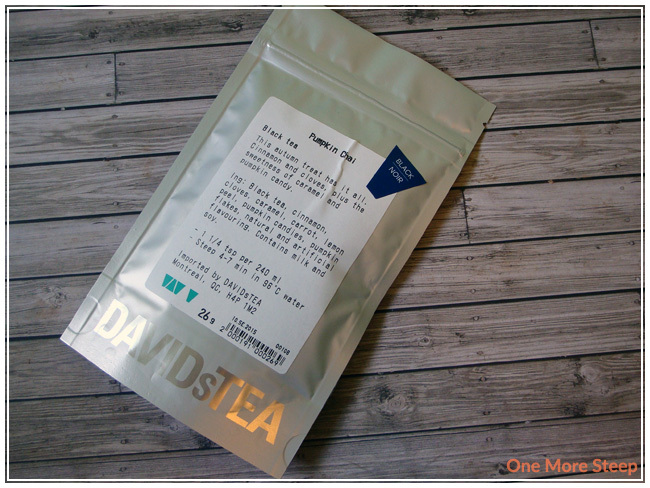 One of the nice things about DavidsTea is that they’re usually quite willing to make up little bags of teas if you just want to try something – I think the smallest bag I’ve ever had weighed out was 10g. Pumpkin Chai is one of their seasonal teas and it’s been brought back for several years in a row, according to the internet. It’s quite a sweet smelling black tea. I can definitely smell the cinnamon and it reminds me a lot of pumpkin pie in a way. The ingredients include: black tea, cinnamon, cloves, caramel, carrot, lemon peel, pumpkin candies, pumpkin flakes, natural and artificial flavouring. It also includes an allergen warning for milk and soy products. At first glance, I can see cute pumpkins sprinkles as well as pretty big pieces of cinnamon and the pumpkin flakes. DavidsTea recommends steeping in 96°C water for 4-7 minutes. 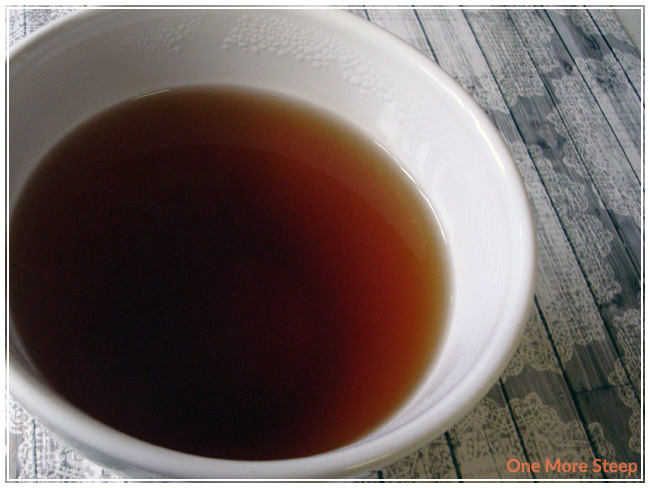 As I love chai spicy, I opted to steep the tea until around the 6-7 minute mark. Pumpkin Chai smells really good when it’s done steeping. It smells like a mix of pumpkin spices and tea – which is a good thing given the name of the tea. It’s a beautiful red golden brown colour. When I take my first sip, I definitely get the feel of mouthcoating. The richness in the tea and the oily sensation may be due to the oils in the pumpkin candies. It’s not an off-putting sensation though, and I didn’t get a visible oil slick across the surface of the tea like I did with DavidsTea’s Birthday Cake. The cinnamon flavour is even more pronounced in the steeped tea than it was in dry format. I quite like it and I can see why Pumpkin Chai is popular enough to be brought back year after year. I am curious about how well this tea will do with one more steep because it does contain some ingredients that usually do not do well when steeped again (primarily candies and flavouring). Surprisingly, Pumpkin Chai did okay on the second steep! It still has a pumpkin aroma and still tastes alright. It’s not as good as it was in the first steep, but it’s hard to expect the added flavouring to hold up for a second steep. I would not expect this tea to hold up very well for a third steep though. I loved DavidsTea’s Pumpkin Chai. The adorable pumpkin candies and the great smell and flavour make it a must-have for me. I can definitely see myself stocking up on a bit more of this tea in the near future to continue to have some great tasting pumpkin tea throughout the autumn. 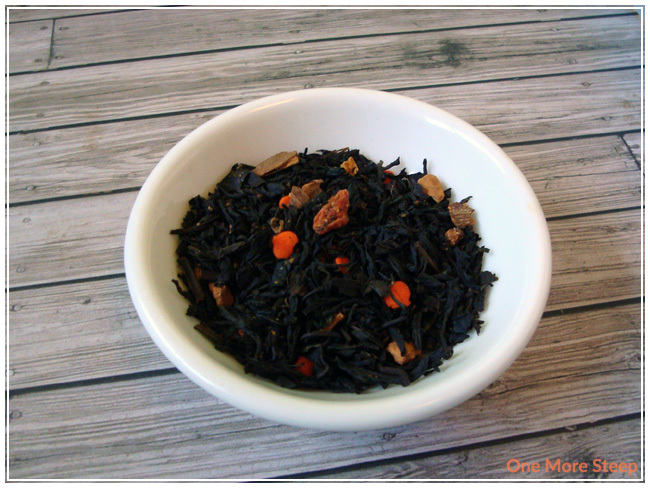 If you are interested in getting some Pumpkin Chai for yourself, do keep in mind that it is a limited/seasonal tea. I don’t think this tea is for everyone – if you’re not into sprinkles/candies in your teas, or you’re not a fan of artificial colours (because there is nothing naturally colouring those sprinkles to be a bright orange), I’d steer away from this one. I personally really enjoyed Pumpkin Chai though! And I’ve heard that it can be really good as part of a tea latte – as a fan of chai lattes I can see that being true, especially when you consider that chai is traditionally made with milk (or some milk and water) instead of straight water. As an aside, the tea menu for DavidsTea’s fall 2015 collection has a recipe for “The Ultimate Pumpkin Chai” latte on the back that I will be giving a whirl soon – and writing about it! This tea sounds absolutely delicious and a Chai latte was my first thought! I would love to hear if you had success with making one. Also, are these teas available in the state? Great post! DavidsTea has locations in the USA, but if you don’t have one nearby they also ship to USA as well 🙂 They’re actually a Canadian company (based out of Quebec), which I think is pretty neat!